Pool - Wall & Gates - Villa - Watchtower - Extra Flora - Fish Hatchery - Fungal Cave - Road - Greenhouse Cave - NPCS - Apothecary - Removed Vanilla Necro Altar. * Optional files that stop interior from resetting and make your npcs walk past your house with certain wing builds. Lakeview Extended Hearthfire - Spanish Translation. * B1gBadDaddy for improve skill script on target dummies. sa547 for "Lakeview Pool and Hot Bath for Hearthfire". jhdez for "Lakeview Manor Fish Hatchery plus opt Mill". * rockyourazz for optimizing the exterior. * subtanker for providing the pool scripts. 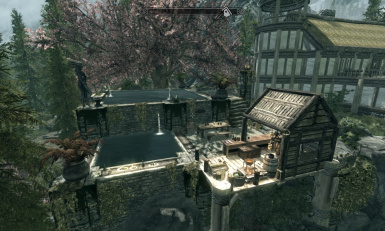 * sa547 for "Lakeview Pool and Hot Bath for Hearthfire" mod. 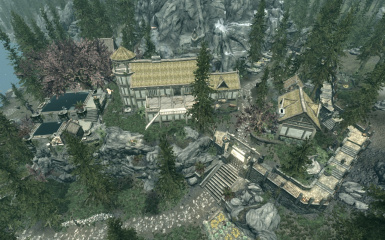 * jhdez for "Lakeview Manor Fish Hatchery plus opt Mill" mod. Spanish Author: Ac3s Lakeview Extended Hearthfire - Spanish Translation. Made some objects completely static to prevent them from falling over (stone pots around farms). Changed the Apiary and Beehives to spawn more ingredients, also changed all Beehives to "respawn", so now you can safely loot any beehives in Skyrim and they will restock after a few days (where as before they never did). 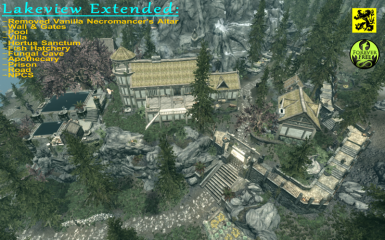 Fixed the fish hatchery from causing issues with the Windstad Manor fish hatchery, both hatcheries are now completely seperated and both will be fully functional. This long overdue incompatibility issue is now fixed. I forgot to add the "exterior optimization" system for the NO_NPC version in the past, so now that is also included in the NO_NPC version. Fixed a Hearthfire bug where the spouse and steward would not move around in the exterior, they would stand on a specific spot on the east side of the manor and not do anything. So I moved a marker and adjusted their AI packages. Made all Lakeview NPC factions be allied to each other and the player. Gave all Lakeview NPCs the "Ally" Relationship to the player. Gave all Lakeview NPCs the "IgnoreFriendlyHits" script. All the above changes should stop the NPCs from fighting each other when getting accidentally hit from one another in combat and they will also assist each other when getting attacked. Improved the exterior optimization system. Added scripts to the target dummies next to the watchtower so you can train your skills on them. Rockyourazz created a system to optimize the exterior, depending on where you stand around the manor items will get enabled or disabled, most objects that you do not see will not get rendered, giving a big boost in FPS compared to previous versions. Added a small "reset" button for the little dragon in the villa, the button is on the bottom of hes rock, if he ever bugs out just press this button to put him back in position. Fixed the dragons (especially Nagra) from flying off or disappearing completely, now they stay put no matter what. Duplicated the chest in the villa to avoid getting keys in other chests around the game. A few NPCs have become minor merchants with things to buy/sell appropriate for their task. Guards are "essential" instead of "respawning/protected" to ensure full compatibility with follower mods like UFO/AFF, you can give them other equipment without any bugs occuring. Removed a few rogue scripts. 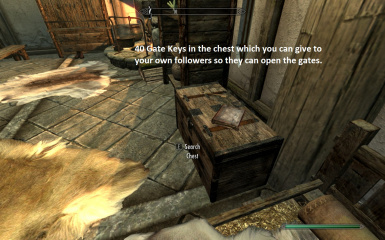 Added 40 gate keys to the villa chest so you have plenty to give to other followers so they can open the gates as well. Lowered the merchants gold a bit. Cleaned with TES5EDIT again to get those last 10 remaining identical to master records. Minor changes on Sitala to make her face prettier. SKINNY-DIPPING ! yes you read it right, you guys asked for this for months, now "subtanker" made scripts for me to make npcs go naked and dress up again when using the pool, enjoy. Changed AI packages to make the npcs use the pool. New remove options for most upgrades. 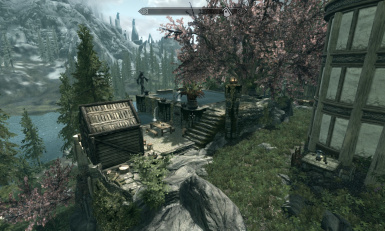 Small prison on top of the mountain, small hut next to the fish hatchery, small goat pen next to the watchtower. More idle markers and improved AI packages. Made every upgrade available from start again. Removed exterior items and interiors that were not nessesary. 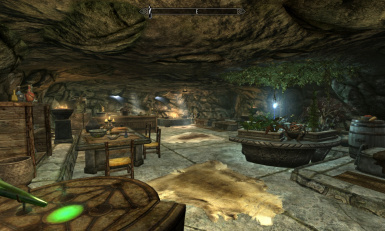 Placed cave interiors in different locations, removed the stone stairs on the mountainside. Added Nagra the dragon and an info book in the villa. Added Apothecary, Added Tunnel, Placed Chaurus Hatchery behind the tunnel, Removed mountain tower. Changed Guards to Followers, changed their spells and perks as well. Changed all guard mages to fire mages. Removed some plants at the necromancers altar garden for a little FPS gain. More HP on bard and horse, horse will flee and bard got 5 health potions. Moved random enemy encounters to the gates instead of the manor front door. Completed Road connections between both main roads. Added functionality to gates, they now remain closed to enemies and lock after 15 seconds, key at Talos Statue, guards have keys too. Added a Waterwell & Road from gate to manor entrance. Added flora for villa & wall area. Added: Villa, Fish Hatchery, Wall & Gates, Road to main road. !! 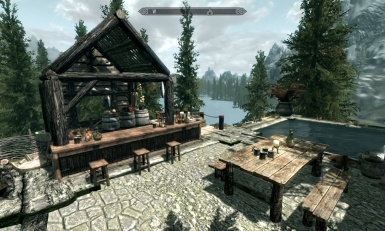 Make sure the original Lakeview Manor is completely build with the upgrades you want to have (through workbenches and steward) before activating this mod or any optional files !! !! If you start a new game or switch character you need to deactivate the mod and optional files until the Lakeview Manor is build !! 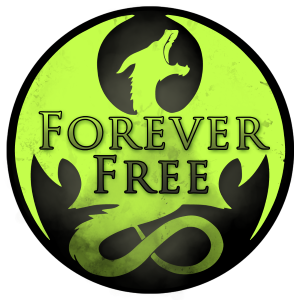 Nexus Exclusive Mod -- Do NOT upload these files to other sites. Any changes, use of content or translations of this mod will require my permission, PM me for details. Traducción al Español, Spanish translation. Tradução Português do Brasil, Brazil Portuguese translation. This mod is all about beauty and lore friendliness, I tried to keep the exterior as simple as possible without making it feel like a castle while taking away the shortcomings of the original. 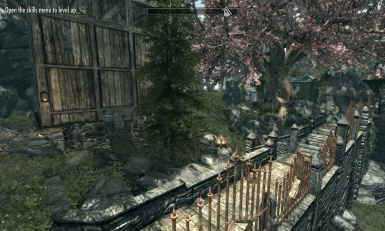 It changes nothing regarding interaction of the original vanilla content, all this mod does is expand the exterior. I also made the mod modular so you can choose to disable/enable certain upgrades if you want to and even install some optional files for other changes. New npcs are added to give it a small town feeling and are realistic regarding their appearance, clothing and use of weaponry/spells, they also keep themselves busy with chores during the day and sleep at night. 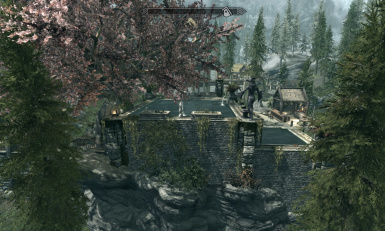 Pool -- for those that fancy taking a swim, npcs will take off/on clothing when entering/exiting. 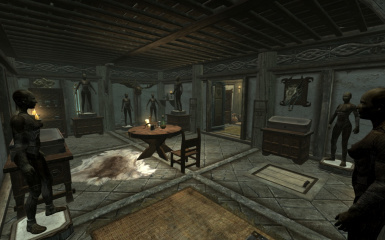 Villa -- providing beds for 5 people, info book and a small dragon on the wardrobe to disable/enable certain upgrades. 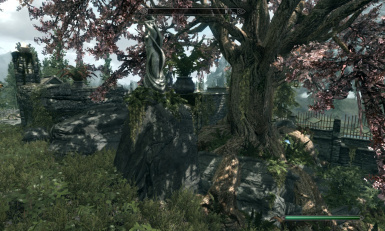 Extra Flora -- for those that love trees/plants/farm plots, not to mention statues. 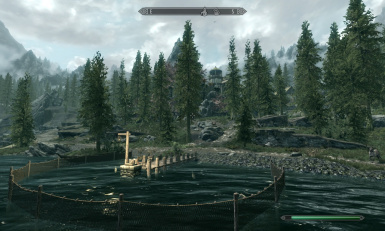 Fish Hatchery -- for an easy fishing time, same as the Windstad Manor's hatchery. 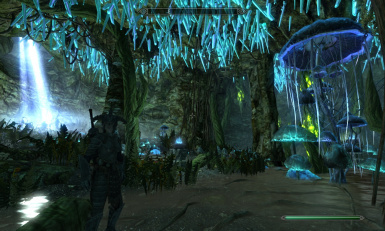 Fungal Cave -- an underground mushroom garden including little chaurus gardeners, entrance at old necromancer's altar. Road -- connecting your manor to both main roads. 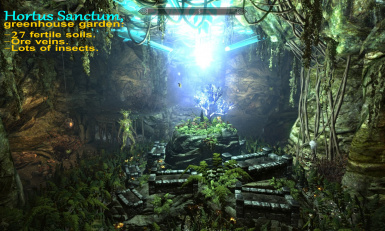 Hortus Sanctum -- greenhouse cavern including ores, insects and spriggans. Apothecary -- a cave where your alchemist shop is located, including 4 beds, entrance under watchtower. 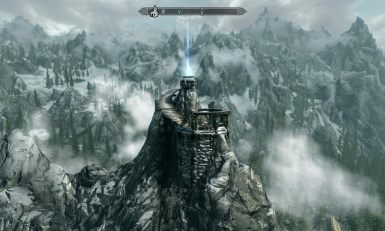 Prison -- tower on top of the mountain, entrance is next to your manor at the bottom of the mountain. 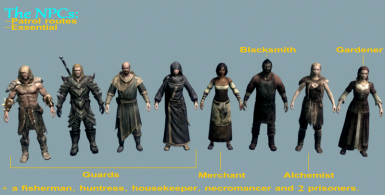 NPCs -- a merchant, blacksmith, alchemist, gardener, huntress, housemaid, necromancer, fisherman and 4 guards. Vanilla Necromancer's Altar -- all items of this horrible looking altar right next to your home are disabled and replaced with a garden. Improved Navmesh -- all added content has been provided with new navmeshes, npc's should follow wherever you go. Optimized Exterior -- most objects that are out of your view around the manor will get disabled, this allows for less CPU to be used and a significant increase in FPS. TES5EDIT Cleaned -- first cleaned automatically and then checked everything manually to make sure everything is in order. Lakeview_Extended_Basement -- an extra bedroom in the basement with beds for 8 people. (see picture "24 Optional Basement_Bedroom") If however you prefer to have noble beds instead then check out the Noble Beds Version. 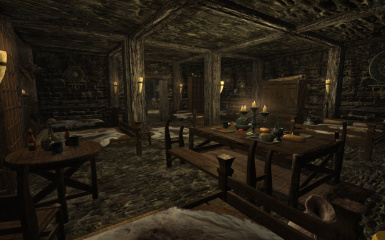 Lakeview_Extended_Interior -- stops your manor interior from resetting, I made this because I got sick of old items respawning and bumping away my own placed items. You can choose to skip certain upgrades like interiors in case you want to use other mods for that, or cows/chickens/horse if you simply don't like those, just DON'T try to build anything anymore once my mod is enabled. Basically you need to construct the entire manor through the bench in the exterior, then all the benches in the interiors and then the upgrades from the steward. 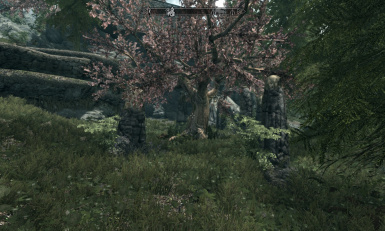 All of this begins if you start doing quests for the Jarl of Falkreath. Only after this is done you should activate the mod and start upgrading through Nagra the little dragon in the villa, you can still activate/de-activate any of my upgrades through the dragon, but you should NEVER use those original benches or steward anymore. Failing to heed my advice and activating my mod before you have that lakeview manor finished can result in the following bugs, such as not being able to buy lumber, not being able to hire a steward, not being able to advance through the "build lakeview" quests, certain original upgrades never becoming visible and the lakeview map marker not showing up. Always make back-up saves before trying new mods. 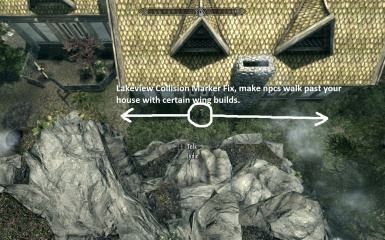 Make sure you are far away from Lakeview manor before installing. Nexus Mod Manager: download the .ESP and .BSA files and activate it to install. Manual: open the 7zip file, then drag and drop the .ESP and .BSA files into Skyrim's Data folder. Dismiss all potential followers from my mod, make sure none of them are actively following you. 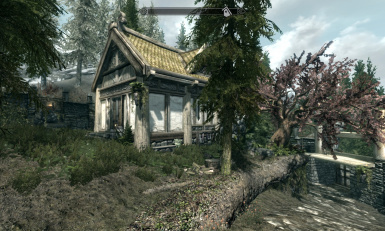 Make sure you are far away from Lakeview manor before uninstalling, wait 40+ days. You can deactivate and uninstall from Nexus Mod Manager, or manually delete the mod. 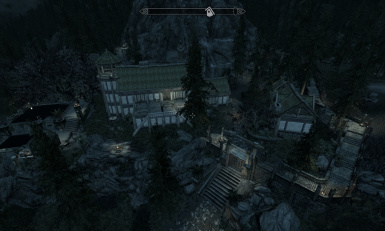 Since this mod stretches over the whole area around the manor, moving items everywhere, even altering terrain, its safe to guess that other mods in the exterior area are NOT compatible. 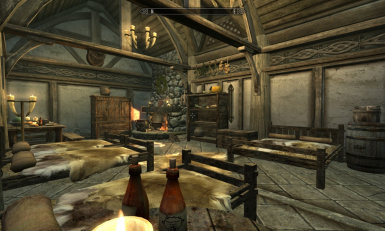 My mod does not change anything in the interior(unless you use the optional files), so you are free to use other mods for the interior as you please. My Home Is Your Home : Set any follower on home/sleep/work/guard wherever you like. Hearthfire Manor Emittance Enhancment : Adds light beams shining through your manor windows. 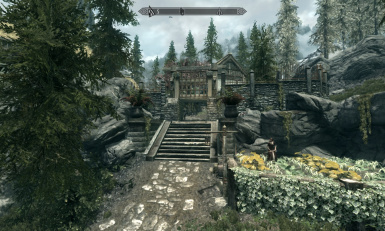 Dragon in the villa voice/options not appearing -- quicksave and quickload the game, then speak to him again, if even this doesn't help then check to see if you are using the Hearthfire Display Case Fix mod, for some reason this mod disables my dragon from speaking so just disable it for a while until you no longer need to talk to the little dragon and then activate the display case mod again. Dragon in the villa not there -- he sometimes bugs out but you can press that tiny button on hes rock to put him back in position. 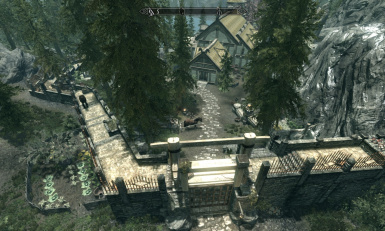 Enemy spiders/wolfs/bandits/giants still spawning at manor entrance -- you need to wait 40+ days far away from Lakeview so that the exterior can reset. Carriage driver still sitting at old location and floating a bit in the air -- you need to wait 40+ days far away from Lakeview so that the exterior will reset. Floating Grass Fix -- also try waiting a few days far away from the Lakeview exterior cell so it can reset and the grass doesn't float anymore. Some people have game freezing/infinite loading screen when loading a save in the exterior or exiting the manor, removing certain upgrades like extra flora/farms/road/prison/fish hatchery helps with this. (talk to the dragon on the wardrobe in the villa.) If you are unable to get to the Villa to disable upgrades because your game freezes or CTD around the exterior, open the console and type "COC LakeviewVilla", this will directly transport you there. 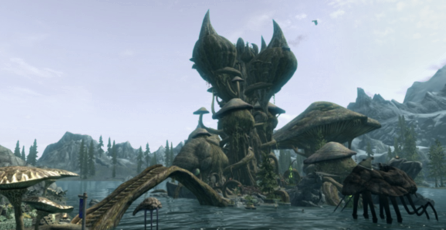 Due to skyrims limited 3.1 GB memory, mods that add an extensive amount of items suffer from this, especially if your also running enhanced texture mods. Try my mod v312_NO_NPCS, some people claim without the npcs this problem doesn't occur. Read the top comment in the "posts" section for more details. sa547 for giving me permission to edit and use hes Lakeview Pool and Hot Bath for Hearthfire mod. 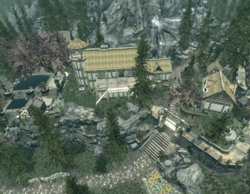 jhdez for giving me permission to edit and use hes Lakeview Manor Fish Hatchery plus opt Mill mod. rockyourazz for optimizing the exterior, objects out of view will get disabled, thus lessening the CPU load and increasing FPS. subtanker for providing the pool scripts. dptheslothking for making a nice video. Xubarku, xxGODLIKExx, ps46183 and all commentators that share their idea's and give constructive criticism. B1gBadDaddy for improve skill script on target dummies. Safe Storage -- Only use your own Manor to store your stuff, all the new interiors that I added are for the npcs. All these containers and interiors are set to respawn so they are not safe to store or drop your items. Even if you use the "no-npc version" you still can't use these new interiors to store your items. To let wait time go faster, open console and type "TFC", one day will pass in a second now instead of waiting for every single hour to pass, when done type "TFC" again. To decorate your home, dump items on the ground, exit manor, re-enter manor, place them where you like. To make your bard Llewellyn essential, type "setessential 03018DE0 1" in the console. He has a bad habit of playing the hero in every fight while dying one second later. If you don't like certain items/plants/trees, you can always open the console in game, select the item, type "disable" or "markfordelete" to remove it. When using "markfordelete" you need to save and load again, but beware that the item will be gone forever, and make sure you have a backup save ready in case you deleted the wrong item. You can also use these commands to make your manor interior better by removing clutter items you otherwise cannot pick up. Since my mod adds guards there is a high probability that when your spouse gets kidnapped(quest) the bandits will be in combat and die before you can open dialogue with them, this can cause a bug to occur that when after you save your spouse he/she will walk backwards all the time and generally does not follow you anymore, as if stuck in place while moon-walking. To fix this open console, select your spouse and type "recycleactor". Some people might want to change certain things in the creation kit for themselves, read my explanation under my mod forums tab for changes inside the SkyrimEditor.ini file so the creation kit can open multiple .ESM and .ESP files. Without these changes you cannot use the creation kit properly. If you want to change or remove certain npcs or creatures, after my mod is loaded in the creation kit go look in the "Object Window -> Actors -> Actor" and type in "Lakeview", this will give a list of all my added actors, if you want to remove one just select it and press delete, if you get warnings keep pressing "yes". 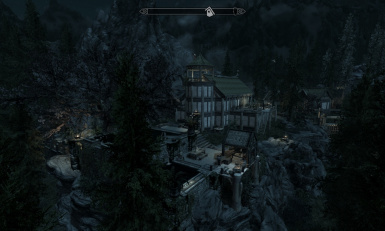 To manually edit things in the exterior you need to look into "Cell View -> World Space=Tamriel -> BYOHHouse1Exterior", double click and it will load, the interiors are under "World Space=Interiors", all my added interiors start with "Lakeview" as well. If you try modding it yourself you should be aware that if you delete stuff you can cause CTD if that particular item was there already in the vanilla game, you will get a deleted reference and when the game tries to load it it cannot find it and so it crashes. 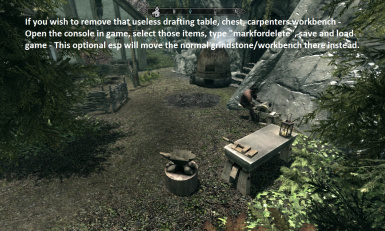 To fix that you should use TES5EDIT program, load the mod, do "apply filter for cleaning", then "undelete and disable references", then "remove identical to master records", press CTRL-S to save the mod. That should prevent CTDs in that department. If you'd like to know how I work with navmeshes in the exterior, read my explanation under my mod forums tab. If you'd like to know how to make npcs take off/on clothing when entering/exiting the pool, read the tutorial created by "subtanker" under my my mod forums tab. Though you must credit me as the original author and I will always retain all rights and permissions to this mod.